How to recover lost data after iOS 8.3 update from iTunes backup? Have upgraded your iPhone and iPad to iOS 8.3, but caused the data loss after updating to iOS 8.3? Well, it seems to be the most common issue on iOS 8.3 updated. It makes you so panic because you have many important data like notes, contacts, messages, reminder, photos, etc. This article aims to give you the best way to recover lost data from iTunes after updating to iOS 8.3. Generally, we can get help from iTunes which is able to restore everything from your iPhone, iPad, but it worth noting not to use your iOS device in case new data produced will be overwritten and erased forever. For those who want to recover the iTunes backup files from the lost Calendar, Whatsapp, Contacts, Notes, Messages or whatever kind of messages only on to your device or computer rather that restoring everything, you then need iOS Data Recovery software- like Brorsoft iRefone for Mac. As one of the best iOS data recovery tool on the market, it is able to recover photos, messages, contacts, call history, contacts, notes and almost all other lost data from iTunes backup files as long as you have made backup files with iTunes. The best of all, this iTunes data recovery software is available to selectively retrieve the contained files from iTunes backup or directly from iPhone 6, iPhone 6 Plus, iPhone 5, iPhone 4s, iPad, iPod Touch, etc iOS devices. And its equivalent Windows version is Brorsoft iRefone. Following is the detailed instruction of how to recover lost data from iTunes backup. Connect your device to Mac, and select "Recover from iTunes backup files". This data recovery mode can selectively recover iPhone/iPad/iPod files as long as you've synced your device with iTunes. 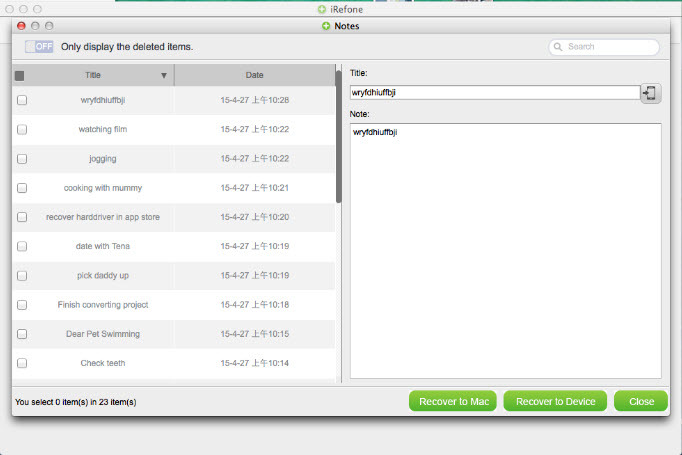 You can choose you wanted backup files of your iOS Device and click "Select" to access the data interface. Tip: If your iOS device backup is not displayed here, it's probably because your iOS device has not synced with iTunes on this Mac or you save the backup in other location. You can click "Select more" button to choose the backup by yourself. When the scanning is finished, you can selectively mark and recover those you want by click the "Recover to Mac" button on the bottom-right to save them on your Mac. Tip: Brorsoft iRefone for Mac supports to transfer recovered Notes, Contacts directly back to device. After scanning these two items, pick out these notes or contacts you need and click "Recover to Device" button on the interface to transfer these recovered Notes and Contacts directly back to your iDevices. You can also edit notes and contacts and save the modified data. 1. Connect the iDevices for example iPhone to the computer with a USB cable.